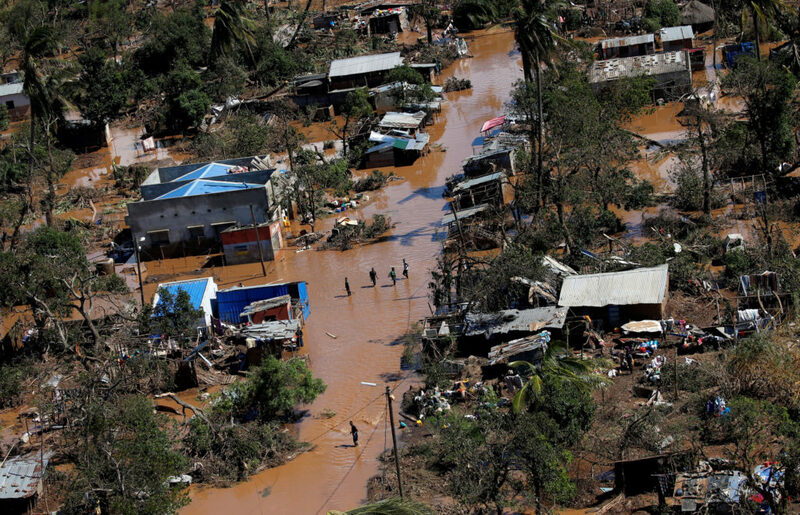 Rapidly rising floodwaters have created "an inland ocean" in Mozambique endangering scores of thousands of families, aid workers said Tuesday as they scrambled to rescue survivors of Cyclone Idai who clung to rooftops and trees. Cyclone Mekunu caused flash flooding that tore away whole roadways and submerged others in Salalah, Oman’s third-largest city. Relief organizations responding to Cyclone Giri, which pounded western Myanmar on Friday, are finding homes and schools swept away and a need for emergency food and water in the saltwater soaked islands. In other news Wednesday, Federal Reserve Chairman Ben Bernanke told Congress and the President to begin reining in the deficit and a series of powerful earthquakes killed at least 400 people in western China. Myanmar's military government started evicting families from cyclone refugee camps on Friday, sending them to rebuild lives with bamboo poles and tarps.